Agatha Christie is the most widely published author of all time, outsold only by the Bible and Shakespeare. In this fascinating travelogue of the prolific author's yearlong trip around the British Empire in 1922, Christie provides the clues to the origins of the plots and locales of some of her bestselling mystery novels. Containing never-before-published letters and photos from her travels, and filled with intriguing details about the exotic locations she visited, The Grand Tour is a must-have for Agatha Christie fans, revealing an unexpected side to the world's most renowned mystery writer. In 1922 Agatha Christie set sail on a ten-month voyage around the world. Her husband, Archibald Christie, had been invited to join a trade mission to promote the British Empire Exhibition, and Christie was determined to go with him. It was a life-changing decision for the young novelist, a true voyage of discovery that would inspire her future writing for years to come. Placing her two-year-old daughter in the care of her sister, Christie set sail at the end of January and did not return home until December. Throughout her journey, she kept up a detailed weekly correspondence with her mother, describing the exotic places and the remarkable people she encountered as the mission traveled through South Africa, Australia, New Zealand, Hawaii, and Canada. Reproduced here for the first time, the letters are full of tales of seasickness and sunburn, motor trips and surfboarding, glamor and misery. The Grand Tour also brings to life the places and people Christie encountered through the photos she took on her portable camera, as well as some of the original postcards, newspaper cuttings, and memorabilia she collected on her trip. 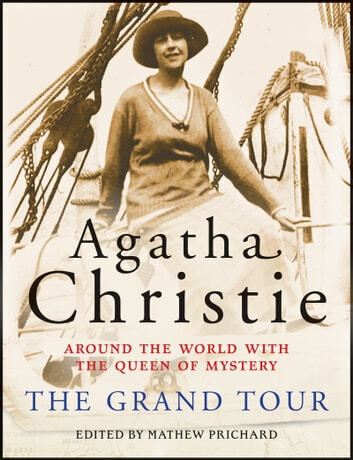 Edited and introduced by Agatha Christie's grandson, Mathew Prichard, and accompanied by reminiscences from her own autobiography, this unique travelogue reveals a new adventurous side to Agatha Christie, one that would ultimately influence the stories that made her a household name.